I have a bad habit of wanting to start on the next project before the first one is finished. So while we still have things to do in the kitchen before we can consider it really done, I can’t help but think about what’s next! 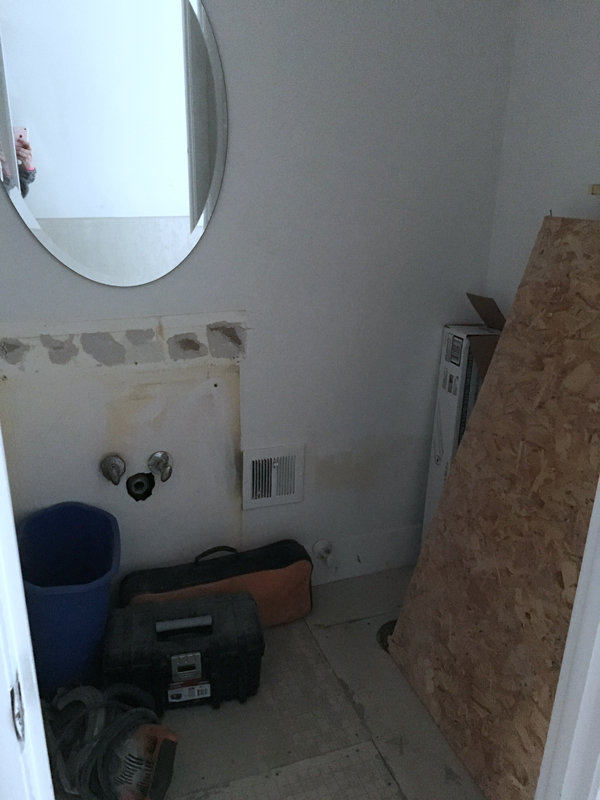 At the same time that our kitchen was under construction, we also renovated our half-bathroom and entryway, so we really want to finish up the details of both of those spaces before we move on to anything else. 1. The Entryway — we removed the hall closet to expose some really cute glass-block windows that were hiding behind the closet doors. 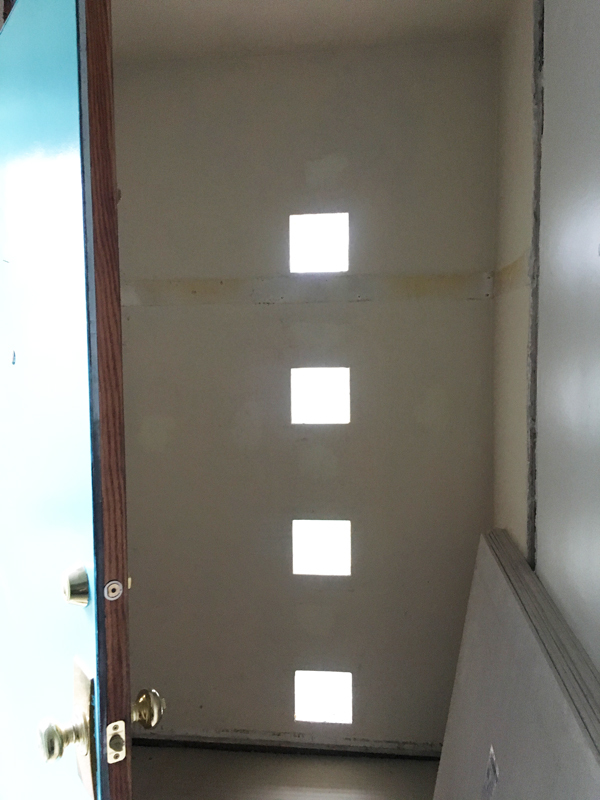 We were left with a much brighter, but completely empty hallway, so we need to figure out a plan to add storage, functionality and also make it look cute. No easy task. 2. The Half-Bath — it is looking so good now, you guys! We replaced the vanity, toilet and floor since the last time we showed you, and I’m really happy with it now. It’s still in desperate need of some art, decor and color, though, and it definitely needs to be livened up. But once those spaces are done, there are two rooms we haven’t touched AT ALL since we moved in: the 3rd bedroom and the family room. 3. The Third Bedroom — it’s what we not-so-affectionately refer to as “the cat room,” where we keep the litter box and food bowls for our two cats, and it’s super depressing and blah. 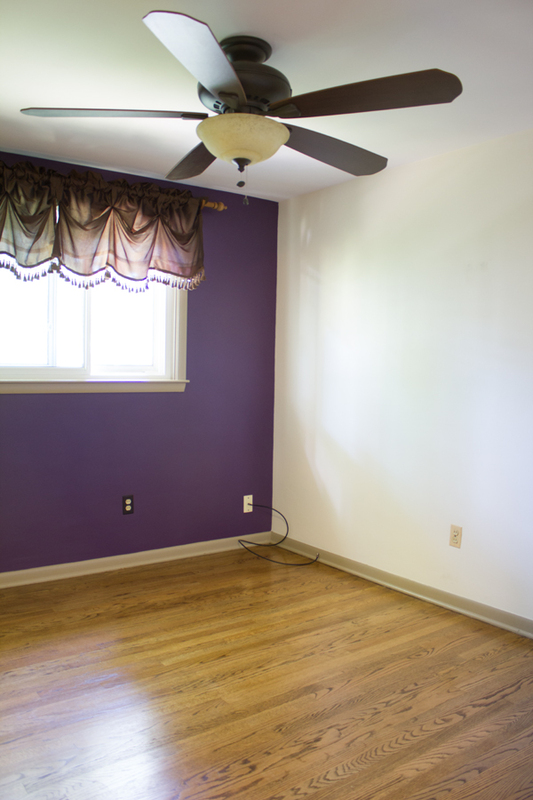 Besides the fact that our cats are the messiest animals I’ve ever met, the room is painted beige and dark purple — two of my least favorite colors — and it doesn’t get a ton of natural light. I think we’re going to turn this room into our office, so it’s in for a big makeover. I haven’t decided 100% on the design direction yet, but I’m leaning towards a fun color on the walls for an all-over lighter and brighter room, of course! 4. The Family Room — our house is a split level, so we have a family room that’s a few steps down from the kitchen/living room. It’s currently a complete dumping ground with lots of extra furniture and unpacked boxes. But even though it’s a large room with a nice, big sliding door to the back yard, the low ceiling, dark floor, beige walls, dark brick fireplace — not to mention all our mess — make it feel gloomy. 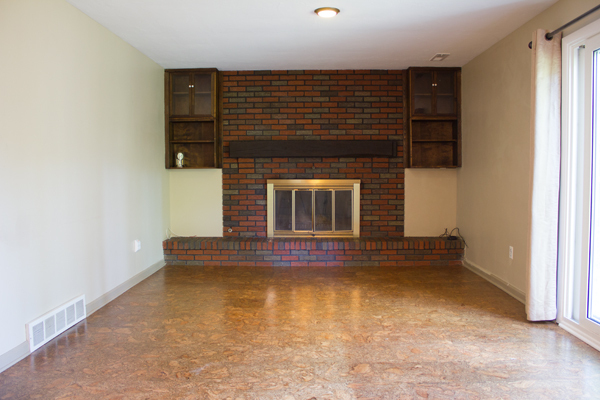 We’re thinking of a bright color on the walls, new lighting, painted brick, and turning the room into a cool hangout space… and maybe a tiki bar? So the hard part is just deciding which room to work on first! !